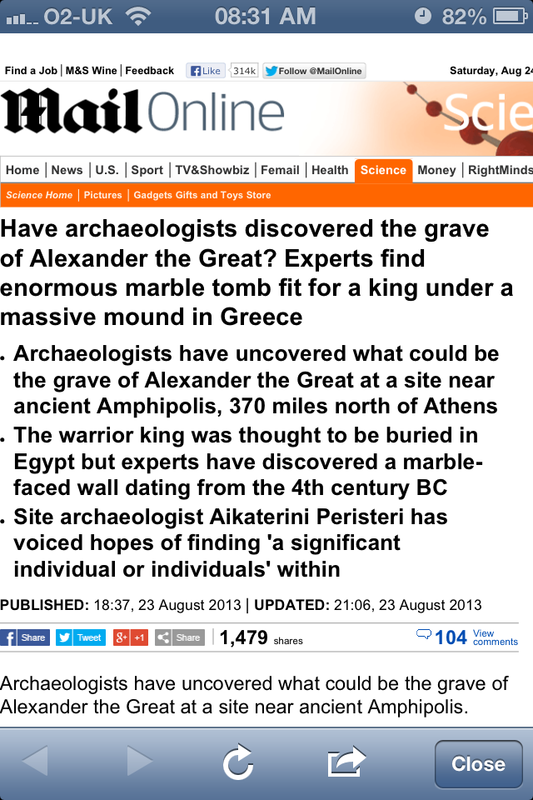 The Daily Mail reports that Alexander the Great’s tomb may have been found near Amphipolis in Greece. … a marble-faced wall dating from the [Fourth Century BC]. The structure measures an impressive wall measuring 500 metres long and three metres high, which archaeologists believe could contain a royal grave. Could this be Alexander’s grave? Well, it might be, but only in the way that a homeless man might be a millionaire. Yes, he might be, but, on the balance of probabilities, it is very unlikely that he is. If Alexander was buried in Macedon the internment would not have taken place before AD 215 as this is when Caracalla travelled to Alexandria and became the last known person to see his body. That’s fine; maybe Caracalla, or one of his successors, sent the body back to Macedon. But if they had would they have reburied Alexander in a 500 year old tomb? The Romans greatly admired Alexander, I think the emperors would have had a new one built for him. Further to that, if they did take him back to Macedon, why does no Roman or Greek writer mention this momentous event? I know we have lost many ancient texts but the silence on this point of those which have survived is deafening. Frustratingly, though, he adds that none of the men ‘specify its exact location’. It seems certain to me, though, that if Alexander’s tomb is to be found anywhere – with or without his body – it is in Alexandria. So, if Alexander is not buried at Amphipolis, who might be buried there? A quick look at Wikipedia’s article on Amphipolis tells me that Brasidas was buried there in 422 BC ‘with impressive pomp’. If that is too early, though, it also says that Laomedon, one of Alexander’s successors, was also buried there. The problem with Laomedon is that I don’t get the impression he was quite important enough to get what appears to be a very grand burial mound. So, the answer to my question is ‘I don’t know’. I will just have to wait and see what the archaeologists discover..I remain as certain as an amateur can be, though, that it won’t be Alexander. Very interesting find but I am certain the the remains of Alexander reside somewhere in Alexandria.